One of the most awaited releases of Dynamics 365 For Finance and Operations is now available (The July 2017 and Platform Update 8). Lot of new capabilities and exciting new features across all the functional modules and quite a few technology stack improvements! !In this post, I will highlight some of the most important new features that are my favorites so far, that I think are going to helpful for customers in big time. First thing first! Starting with the July release, there is a change in the naming of the Dynamics 365 apps . Earlier we had “Dynamics 365 For Operations”, which basically represented the Enterprise edition of Dynamics 365 and “Dynamics 365 For Financials’ which represented the Business edition targeted for SMB customers. Starting with the July release, the naming will be as below. You should notice this name changes, when you login to the new version. Here are some of my personal favorite features and functionality fro this latest update of Dynamics 365 For Finance and Operations. Microsoft Power BI is the backbone of Dynamics 365 for delivering critical business intelligence to all users of an organization with rich interactive visuals, dashboards and reports, with appropriate drill downs, data filter options etc. When Dynamics 365 was first released, users had the option of consuming preconfigured or customized Power BI dashboards and reports from their PowerBI online workspaces right into their workspaces within Dynamics 365. This is a great capability and allowed users to mash up data from Dynamics 365 or even from external data sources and then see them all together right on their workspaces. However, this required every users to have at least a free PowerBI.com subscription to be able to do this. With the July 2017 update, Power BI Embedded services are integrated into Dynamics 365. Embedded Power BI is a Microsoft Azure Service that allows to embed the dashboards and reports directly into Operations workspaces of Dynamics 365. Embedded Power BI is an ideal way of presenting near real time data insights, with Direct Query to the Entity Story (Data warehouse for Dynamics 365). These embedded dashboards and reports are available for all users with the base license of Dynamics 365 for Finance and Operations and does not necessarily require the user to have a PowerBI.com subscription. The diagram below shows the key difference between the PowerBI Online and PowerBI Embedded services. The good news is, Microsoft has already shipped several out of the box PowerBI asset files within Life Cycle Service starting with the July 2017 release, which can be simply included in the Dynamics 365 deployment options to get instant access to readily available dashboards and reports across all major business areas. Below are some of the sample examples of these embedded Power BI dashboards and workspaces in Dynamics 365. This one is a HUGE step forward!! Since Dynamics 365 launched back in February 2016, the Primary objective and goal for Microsoft was to combine the best of Dynamics CRM and ERP worlds and provide a unified experience to end users, so that they can advantage of best of breed functionalities within the Modular apps for Sales and Financials & Operations and still be able to integrate the data flow between these apps seamlessly to get a 360 degree view of their business. We have seen steps Microsoft has taken in last several months to get the Common Data Service (Azure Public Cloud data storage) Platform ready for prime time along with the supporting surrounding services such as Microsoft Flow and PowerApps. With the July release, these all are coming together as a first significant step towards truly unifying the CRM and ERP worlds. This is the beginning of the departure from the traditional custom 3rd party integrations between CRM and ERP. The following key scenarios are supported currently with this integrations, primarily in the Supply Chain side. More to come in future. I have not got chance to test this end to end yet. Will share some details when I am able to test it in coming weeks. Maintain accounts in Dynamics 365 for Sales and sync them to Finance and Operations as customers. Maintain contacts in Dynamics 365 for Sales and sync them to Finance and Operations. Maintain products in Finance and Operations and sync them to Dynamics 365 for Sales. Create quotes in Dynamics 365 for Sales and sync them to Finance and Operations. Generate sales orders in Dynamics 365 for Sales for existing products and sync them to Finance and Operations. Generate invoices in Finance and Operations and sync them to Dynamics 365 for Sales. Mobile workspaces/apps were introduced with the Update 3 release of Dynamics 365. Since then, these workspaces have been evolving and Microsoft continues to deliver more and more mobile workspaces covering various mobile business process scenarios. Some of the key mobile workspaces that were released in the July 2017 update are as below. The highlight of these workspaces is the mobile app for Project Timesheet Entry and the Expense Management app. I provided my views on the preview version of these mobile workspaces in my earlier post. These workspaces have added significant amount of new features with the July 2017 release. The Expense management workspace now support end to end expense management from receipt capture, new expense report creation, submission, expense approvals and expense status inquiry and so on. Below are some screenshots of the mobile workspaces released in the July Update. There are several new features and usability enhancements that are introduced for Employee Expenses management in the July Update. From all these features and enhancement, my favorites are as below. Grouping of vendor invoices for different expense lines of an expense report, as opposed to create separate vendor invoices for each expense line, for reimbursement. This was one of the most talked about concerns in the earlier version (AX 2012), since it was causing problems creating individual invoices for each expense lines and there by causing issues in Check printing etc. Now with this release, you can optionally group all expense lines with the same method of payment to post as grouped vendor invoice instead of individual invoices. If you enable the grouping of vendor invoices, this functionality basically posts all the expenses of the expense report with same payment method on the recent transaction date from the list of expense lines. Several usability enhancements in some key screens. Also, Employees can now track payment information for their expense reimbursements. Nice and very useful functionality, as this is one point that customers usually ask and they used to customize it in AX 2012. One of the most common asks from customers in the AP invoicing area is the functionality of OCR and vendor invoice automation. Organizations often offload the paper invoice processing to 3rd party OCR reader service providers. These service providers provide machine readable metadata for the invoice along with scanned imaged the invoice headers and lines. In the July 2017 release, the solution/standard interface to read these invoice metadata and invoice scanned attachments is in-built into the AP invoice process of Dynamics 365. 3rd party OCR service provider systems will be able to send metadata feed for invoices directly to D365FO. This new functionality basically provides the following. Out of the data entities invoice header, invoice lines, and invoice attachments. Exception processing for invoices. A frontend UI for users to make it easy to track failed invoice imports. A side by side invoice attachment viewer to imported invoices and exceptions. This feature will be available with July 2017 Update and you will also need to have the most recent Platform update of Dynamics 365, which is Platform Update 8. This features let’s the power users or the BI report creators to add financials dimensions to the readily available aggregated measurements or custom built aggregated measurements in the Entity store. With that, when the Entity store is periodically updated/refreshed, the financial dimension information of all the General ledger transactions will automatically be included in it. Then you can use those aggregated measurements to write joins, queries within Power BI to create any sort of financial report/dashboard within Power BI itself. Screenshot below shows just an example. In the earlier versions/releases, you could generate financials reports and export/save it to your local computer. With the July 2017 release, you can now save financial reports directly to a SharePoint document library. The benefit of this is, you can setup alerts within SharePoint to notify you when new reports are available. Note: I don’t have SharePoint configured in the demo environment, so not able to show the full experience. You could also extend this further and write a Microsoft Flow, to automatically send the reports directly to your inbox from SharePoint. Endless possibilities !! You can upgrade from Dynamics AX 2012 to Dynamics 365 for Finance and Operations, Enterprise edition. The complete Dynamics AX 2012 database can be brought forward, and your AX 2012 codebase can be upgraded to Finance and Operations. You can migrate from Dynamics AX 2009 to Finance and Operations via a migration toolset to bring forward master data and opening balances. It would be interesting to test these upgrade experiences and tools as opportunity comes !! The Upgrade is now more predictable, which reduces the overall cost of the upgrade process. Upgrade starts with an automated analysis phase, which defines the preparation tasks required to reduce the time and cost to upgrade, as well as the ongoing future cost of Finance and Operations. Post upgrade, an automated validation phase provides statistics and metrics on the success of the upgrade process. The validation details can be used to quickly assess the state of the upgrade, so you can continue with functional testing and sign off. In Finance and Operations there are no expensive upgrades needed to stay current and take advantage of continuous innovation. You can update to the latest versions of the product with a click of a button. In one of my earlier posts, I explained some details about the 3 different deployment options that Dynamics 365 is going to provide. Starting with the July 2017 Update, both these deployment options are available. 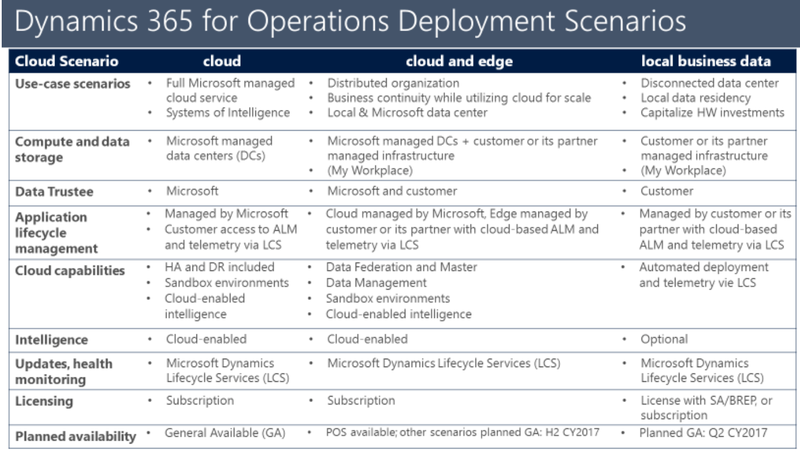 Customers who are keen on having an On-premise deployment of Dynamics 365 for Finance and Operations to capitalize on their existing infrastructure investments or due to data security and compliance requirements, will have the option to deploy D365FO in Hybrid as well as On-Premise model. There was system requirements document also that Microsoft published. See URL below. I will share more info about this in future as we move with some testing and some actual deployments for customers. That was a long enough post :). There are several other features and functionalities across technology stack, Retail and manufacturing modules, that I have not highlighted here in this post. There is a lot to explore and learn!!! Stay tuned and stay current !! Till next time..